Hello everyone, this is my first day on this forum. My name is Ashley and I'm 20 years old. I've done a small amount of quilting a few years ago but none since. Today I'm working on a rather ambitious project as a gift for my boyfriend. I'm trying to make a panel quilt that is weighted. If you are not familiar with weighted blankets, they are filled with plastic pellets to provide therapeutic weight for sensory related disorders such as autism and anxiety. I know this is pretty challenging endeavor for someone as new to quilting as I am, but I feel like I have a good start. The issue I'm trying to figure out is how to add the pellets into a panel quilt without stitching across the image in an obvious way. I'll include a picture to this post. I know that typically they are sewn in equal squares. My original idea was to see them into batting, then sew the pieces over that. I'm not thinking that will work well. Does anyone have any experience in what I'm trying to do? 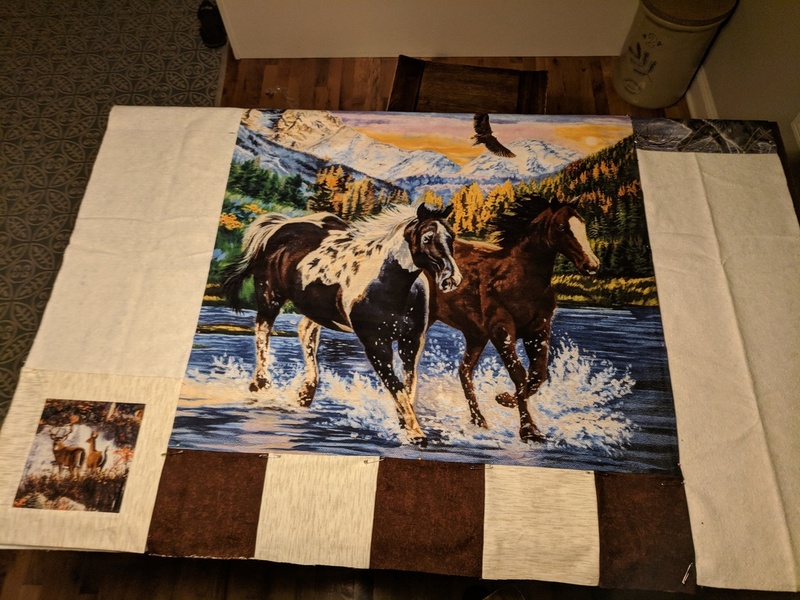 I hope I can ask for help on this forum while I complete this summer project and if anyone can help me learn more about quilting I would appreciate your feedback and suggestions! Welcome from Texas. This is the right board to come to for answers to your questions. Here's a you tube from Man Sewing that shows how to make a weighted blanket & I hope this helps you. It's been a while since I've watched the video so not sure if it will answer all your questions but I think it will help. We would love to see your finished project. This one is a lap quilt, but the panels are larger than you usually see in a weighted blanket. If the stitching is done in an unobtrusive thread, I think it will look good. You could make the quilt separately like a duvet and use the panel for the duvet cover. It would also make it easy to wash the panel/cover. You'd have to have some ties or something to keep it from shifting inside the cover when in use. Welcome from North Carolina! To answer your question... I don't know. This is way above my pay scale, but you've come to the right place. There are many experienced quilters on this site that will help you with almost everything. Trust me, I've been quilting for 100 years and somebody here teaches me something every day!! Thanks everyone for the replies! @Krisb, that was a very helpful link, as my quilt is pretty small. Ive been trying to reply to this thread with pictures, but it says a mod will have to approve them. I made one weighted blanket a few years back and am thinking of making myself one. I don't need it for any other reason than at night I like weight on my shoulders when trying to fall a sleep and with warmer weather finally here I don't want to cover up with a lot of blankets. Has any one just filled one part way. Was thinking of using sheets. Here are some photos of what I have so far. On the left and right sides, i plan to have three wandering geese pointing upwards in the same two colors as the browns on the bottom. I have it pinned to the batting for now while I size everything. I will also have two log cabin squares in the two empty corners. Last edited by Alpaca; 05-25-2018 at 08:54 AM. so that the pellets don't shift around, I think you will need to keep the pellet pockets equally spaced in both directions. You could use invisible thread like Superior Mono-poly or YLI's--try it out before you use it, but do use the thread netting that will come in the package and also you may need to loosen the top thread tension just a bite--but check on a sample first cause that isn't always needed. I made a weighted blanket several years ago. Like another has suggested, I'd use your panel as a cover and, if you want it fastened to the weighted part, finish it by tying. You won't need to launder the entire piece that way. I can't imagine trying to handle the weighted blanket when it needs laundering and this would give extra life to the weighted part. If you want quilting as a feature, perhaps create that and add a single layer to the back so the weighted part can be slid inside. A bit of effort, but I understand the quilts are greatly effective for the stressed, emotionally challenged, etc. of all ages (say 3 years on up), She also gives a guideline that the added weight should equal about 10% of the person's body weight. This has sparked my imagination and I might see what the need is in our community. Your quilt looks great so far. I like the idea of the flying geese and log cabin blocks. I agree with the others that your best bet may be making that a "duvet cover" for the weighted blanket. I made a weighted blanket for my friend with fibro myalagia. She loves it, but I wish I had thought of a cover. And welcome to be board from Northern CA. I have learned a LOT from these wonderful, generous people!! welcome! straight seams, nice and square, you are doing great, I hope you continue on with the craft. Thank you all for your support and kind comments . I do think the duvet idea might be best. Since I will still add the batting, it would have the option of being just a regular quilt when he doesn't want the weight or when its hot. I have all summer to work on this so I'll think about my options as I work on finishing the panels and squares. I made one of the log cabins but it came out a little wonky, so I might redo it. Now I'll need to look at how I will go about making a duvet cover. Also, since you are wanting to use a panel to make it, accept that the quilting will show somewhat. In your spot, I would try making the stitches stand out kind of like looking through a window. The most important part is the love you add, and the comfort it gives right? Welcome from Oregon. Welcome from Idaho! Can't help with the weighted part, but check out http://www.allpeoplequilt.com/quilt-...ig-block-duvet for a free pattern called "Sweet Slumber Duvet Cover". I made one for my mom and it is simple and easy to do. It will give you an idea for the duvet at no cost. Good luck with your summer sewing and beyond! Don't forget to post finished photos, would love to see what you decide on. Jules51- You mentioned a duvet cover so I am going to ask you my burning question. How on earth are comforters kept in place inside a duvet cover. It would seem to me that unless it is somehow held in the corners it would just ball up inside and add that much more to do when I make the bed each morning. Am I wrong? I have been gifted some beautiful duvet covers and one hand made one and have never used them because I have enough to do making a temperpedic bed without arm wrestling a comforter in a duvet cover. Am I wrong or do they stay in place inside the cover? All of my comforters and duvet covers are cotton. Please help me understand this? Madamekelly - I find that duvets stay nicely in their covers unless the cover is much too big for the duvet. I have one cover that's too big; with it, I hold the bottom corners (of cover + duvet) and shake it towards the top once a week when I change the sheets. Otherwise, they just stay... by friction, I guess? Give it a try; since you already have the comforter and duvet cover, the worst outcome is that you don't like it and go back to your old system. Good point. I will try it when I change the bed Tuesday. Thank you for this. I have a newbie question. What type of material should I use for the back of the duvet? Should I just use the regular quilting fabric Ive been using, or something softer/stronger? Im trying to reduce heat since there will be the weighted insert. I suppose if worse came to worst, one could use safety pins to hold the quilt/comforter in place in the duvet. Might not look very elegant, but it would work. This has been an interesting thread. My daughter has MS and I plan on making a weighted blanket for her but do plan on making an insert of the sectioned pellet pockets using muslin; an attractive print for the top and minky for the backing. My plan is to put velcro tabs sewn into the OUTER four corners of the muslin insert and then velcro tabs sewn into the INSIDE corners of the 'cover' so that the pellet/muslin insert would stay in place and also not require regular laundering. I would probably add a couple more velcro tabs on the 'open' end, which I would consider being the bottom of the blanket. I thought the pellet insert should be 10 pounds per 100 pounds of body weight. A little math, huh? Would I be crazy to make the blanket 42x60, or is that too large? My daughter is 5'10". Thank you. I've actually done a lot a research on weighted blankets. I work with therapy center for children and we sometimes use weighted blankets with a few of the children during nap time. The weight is recommended to be 10% of the body weight with a lb or two added if desired. They are made to be small as to focus all the weight on the body and not on the sides. My quilt is (at least planned to be) 3ft x 5ft and 15lbs, and my boyfriend is 5'2 and 140lbs. My boyfriend loves quilts, he also has aspergers which is my reasoning for weighting the quilt. Since I cannot spend time with him during the summers when school is out, I decided I would "mail him a hug" because I'm just corny like that.